GRAND RAPIDS -- After 80 days of traveling in her kayak, battling the Great Lakes region's most rugged and dangerous coastline, Star Swift will admit that Lake Superior taught her a few major lessons. Many were simply about herself. Swift, an attorney and law professor at Grand Valley State University, completed the 1,300-mile circumnavigation of Lake Superior this summer. She left June 10 from Big Bay, where her family has a home, followed the shoreline toward Minnesota and eventually Ontario before returning to Big Bay on Sept. 2. "The biggest challenge was the crossings," said Swift, 46, referring to the time she and her kayaking partners spent crossing open water between points of land, often many miles offshore. "The crossings are mentally fatiguing," she said. "They really play on your mind because you know what can go wrong." What can go wrong is almost anything. The lake is known for its treacherous, violent nature. Gale force winds can blow up without warning, driving walls of water like freight trains into the ragged, rocky shoreline where they explode against the rugged cliffs, and no safe harbor exists. Or the wind can blow with such force that kayaks become difficult to control. Progress can be reduced to fractions of a mile per hour. Fatigue can set in. Progress can slow further. A kayak can be rowed or blown further out into the maelstrom. The exposed crossings, Swift said, were a necessary evil. She had to be back at the university to teach in the fall. There wasn't time to follow every nook and cranny of the lake's jagged shoreline. "The biggest seas we encountered were about 10 feet," Swift said "They came out of nowhere and totally engulfed us. We were paddling down the Pukaska, Ontario shoreline and were out quite a ways, and they were getting huge. "They went from 2-footers to 10-footers in about two hours. We were wondering how much bigger they could get, but fortunately we found a bay to pull into." While open water proved to be the biggest challenge, Swift, a driven athlete, said her days on shore proved the toughest times. "The toughest was at Gooseberry Falls, Minnesota," she said. "The wind was blowing 40 miles per hour. We got socked in for four days. It was very discouraging. "The wind and rain were so bad, there was nothing to do but sleep in the tent and go into the state park building there where they had a fireplace and we could stay warm. "I wasn't prepared for the waiting, but I had to buck up." It was one of the many lessons Swift would learn. There is a natural rhythm involved in such an extensive undertaking. Learning to live with the elements is required. Pacing is important. Average days involved paddling 25 to 30 miles. It could take from nine to 14 hours to reach a destination. With so many miles to go and so much unpredictable weather, Swift found herself chaffing any time progress slowed. Her style is more that of a sprinter than marathoner. Coming to grips with it would take some doing. "I was dying when I had to wait," Swift said. "I was like an unbroken horse. But part of what you learn is that you have to go at the lake's pace." That she would learn in the good company of others. Swift took up kayaking only seven years ago. She'd spent a lifetime on the water, the last 20 years involved with sailing. But the simplicity of kayaks captured her imagination and in 1998 she traveled to Greenland to paddle with a group in remote fjords. In 1999 she ventured to Chile to paddle, again with a group in Patagonia. This summer her goal was to paddle around Lake Superior. She had every intention of making the trip by herself. A traumatic romantic breakup left her wanting solitude. But Swift would come to appreciate the company she was soon to keep. Her paddling partners each had something to offer. Sue Dillsworth, a friend, would join her at the end. Marie Roberts joined Swift soon after she departed. Roberts, of Kingston, Ontario, would go most of the way around. Twenty years Swift's junior, she was enthusiastic about paddling. So much so she had paddled from the Georgian Bay on Lake Huron to catch up with Swift and had already spent 40 days on the water. "When she first caught up with me and first asked to paddle with me, I told her, 'No, I wasn't interested.' I think she was shocked," Swift said. Roberts persisted. Swift agreed to a trial. The two managed to forge a friendship over the next few days, and Swift said she began to feel the safety of numbers. It began with an experiment in plywood. Eighteen years later, Al and Betsie Anderson have combined artisanship with ancient traditions to create sleek, glowing watercraft. Discover the alchemy that makes Betsie Bay Kayaks the most sought-after boats in their class. Legs straight, leaning back in the small cockpit, I sit inches above the crystal water. Each stroke of my paddle cuts a smooth swath into the cool glass of Benzie County's Lower Herring Lake. The long, narrow kayak moves swiftly, effortlessly, quietly. The shore is now a sandy blur, the sleek kayak is like a second skin, and the only sound that matters to me on this late-summer afternoon is the rhythmic slicing of wood against water. Al and Betsie Anderson float nearby, watching from their needle-bowed boats. "Doing good keep the paddle low, stay centered,"Al instructs, looking like a young King Neptune with his well-muscled physique, golden hair, intense blue eyes and nostrils that flare above a wide blond moustache and flowing beard. Betsie is half his size, a sprightly mermaid with a sultry voice. The couple is giving me, a beginner, a hands-on demo of one of their southwest Greenland-style hunting crafts better known as a Betsie Bay Kayak and now it's showtime. Al crosses his arms in front, holds his breath, leans hard to the right and disappears under the water, revealing the kayak's underside. Then, like some kind of life-sized tippy toy, he is right side up again. "An Eskimo roll,"he explains, water streaming from his beard, and not a drop inside the kayak. Like the ancient Inuit kayak built thousands of years ago by Greenland Eskimos to spear whales from the sea and tow them home, these are unsinkable. At $3,000 a pop, sans paddle, they'd better be. It's just one of the reasons aficionados consider these lightweight, high-performance, handmade-in-Frankfort beauties the Ferraris of sea kayaks. Later, the Andersons sit with the sun beaming into the great room of the geodesic dome house they built a couple years ago outside Frankfort. It's full of natural light, a couple of huge dogs, and high-gloss furniture that he made of exotic wood remnants for the boats they produce in the small shop behind their house. They lead me on a tour, upstairs and down, proud of the marvel of angles that took them 18 months to build working side by side, much of it during the long winters of the North. Betsie did all the ceramic tile work, put up the kitchen cupboards and completed the job with carved wooden mouldings. "We still had to run BBK as we were trying to build the house,˜ says Betsie. She's the paddle maker and fine-detail person for Betsie Bay kayak. ¯It was a real challenge for both of us especially as newlyweds. It really cemented us together, that's for sure." Al was a widower with two young daughters and was looking for help for his business when Betsie came into his life. They knew each other through music she often caught his band, Leo Bass & The Bluegills, in local establishments. The former Betsie Polhamus, a native of Allen Park, had been working as a waitress for years and had carved herself a reputation downstate as "the singing waitress"at Peppina's Restaurant in Lincoln Park before she moved Up North. She was ready for something more challenging, so she applied for the job of making paddles at Betsie Bay Kayak. "Betsie had no preconceived woodworking ideas,"Al says, so she was perfect for the job. He taught her how to shape and sand the long, narrow blades that characterize Greenland-style paddles, for which Betsie Bay Kayak is also known. The couple was the first commercial producer of the designs in the U.S.
"She was careful, meticulous and caring,"Al remembers. A woman after his own heart. It wasn't long before they fell in love and married. Though they initially worried about their age difference he's now 48 and she's 33 that concern has faded during the six years since their wedding. Not only have they raised Al's daughters MIkki has become a freshman at Northwestern Michigan College and daughter Kori will be a senior this fall at Frankfort High School but also they have remained good business partners and become members of a rock/blues band called Betsie Baye & Groove Engine that plays clubs all over the state. When we invite people to our place of business, we're really inviting them into our lives,"Betsie smiles. She is part tomboy, instantly likable, a warm hostess. Al is calm and Zenlike, a man who lives in the moment. loves the beauty of the nature that surrounds their house and the quiet of the water when he takes to one of his kayaks. Back in the 70's, the Scottville, Michigan native worked as a freelance photographer and made linotype cases for the defunct Thompson Cabinet Co. in Ludington, where he learned the fundamentals of woodworking. A t the same time he worked three other part-time jobs while attending West Shore Community College and playing saxophone in the Scottville Clown Band. Despite a sharp brochure and Web site that looks for all the world like Betsie Bay Kayak is a large-scale operation, the Andersons are more artisans than manufacturers. "People get this idea there's a BBK factory with a bunch of hourly employees,"says Al. But production is very limited. "In the past we've done as few as 12 a year. Wee may do 24 this year. I'd like to reach a point where we could do three boats a month." Those who might be considering making kayaks for a living should probably think again. "I work more hours and make less per hour than a McDonald's worker,"Al sighs. But he is a driven man, a perfectionist, and like fine wine, there will be no kayak released from his shop before its time. It all started with a crude experiment in plywood. Anderson wanted a fiberglass kayak but couldn't afford to buy one, so he designed one from photos of Inuit vessels he found in a 1974 National Geographic article and used dimensions from the buyers guide in canoe magazine. On his maiden launch, he realized his design had handling virtues his friends' kayaks lacked, so he began a passionate pursuit that lasted 18 years, reading everything he could lay his hands on about Eskimo kayaks and taking as many modern sea kayaks for test paddles as he could. During that time, he attended more classes at Washtenaw Community College in Ann Arbor, and ended up at Life Chiropractic College in Marietta, Georgia, becoming a chiropractic physician. While Anderson worked full time adjusting spines sacroiliacs, his sea-kayak hobby turned into a self-supporting sideline. He made hundreds of prototypes, selling them as he went along to fuel his research and development. With a decade of chiropractic skills under his belt, plus 20 years of multi-disciplined martial arts training (he has a black belt in Tae Kwon Do), he had a well-honed understanding of the way the human body operates. Nine years ago, he decided to apply that knowledge to his kayak designs full time. He molds by hand six long distance, open water kayak models out of plywood/epoxy with hulls sheathed in fiberglass cloth. All are variations on a theme; Seats are geared for proper lumbo-sacral support, and each kayak is custom-fit for paddlers weighing anywhere from 90 to 250 pounds using mini-cell foam to pad out the small cockpit. "We are the only manufacturer with one design to fit all people,"says Anderson, who dismisses one well-known kayak maker's 27 models as ridiculously unnecessary. On the other hand, he bristles about the disturbing trend of the "one-size-fits-all"kayaks found at discount retailers, with little or no instruction on how they should be operated and often without any safety equipment. He points to recent kayaker drownings that have made the news and says they probably were in the wrong kind of boat, without a life preserver. And he rails about sporting-goods salespeople who don't understand the difference between a whitewater or river kayak and one for open water. "People who are very proficient at river kayaking are not necessarily qualified to do open-water or vice versa," he says. "They're entirely different environments, they require different skills, different equipment, with some crossover. "Anderson believes the best kayak design for open water, the one the Eskimos perfected, features a hard, or what's called a multi-chined hull one with a V-bottom and hard corners like the edge of a ski. Such a design provides tracking, much like the center board of keel on a sailboat allows it to track against the force of the sail. "Round-bottom kayaks are derived from canoes, which the Indians, as opposed to Eskimos, used for river travel,"he explains. "Because water on the river's moving, you want a rounded hull that does not grip the water. With an open-water kayak, you want a hull that will basically disregard the wind and use the water as a groove, as a track, so to speak. Most of the modern recreational kayaks we see now are actually derived from whitewater design." Those vessels often are equipped with foot-operated rudders or retractable skegs to keep the kayak steady in the wind. Anderson is a purist in this regard. He believes sea kayaks should be unfettered by add-on controls (only paddles, which are a specialty unto themselves). Greenland Eskimos never used rudders because they didn't need them. They had kayak hulls that were intrinsically stable in the wind, whereas the river boats are not. "They blow all over the place, and so they need something added on,"Anderson says. Anderson also believes that beauty is secondary to efficiency even though a Betsie Bay Kayak is a true work of art. "We've had people buy our kayaks because they're so pretty,"says Betsie. "But I would rather sell a boat to someone who appreciates the performance,"Al says. He would also hope that anyone who likes his kayaks would be interested in the ways of the Eskimos of Greenland, so he offers a list of reading and video resources with every kayak he sells. Yet Al Anderson has never been to Greenland. "I haven't had time to go to Greenland because we never get caught up. Right now we're six kayaks back-ordered." We've been working off the waiting list about 10 years,"Betsie says. "Last year we had a kayak here for three days that didn't have an owner, so we put the word out and then we had four people begging for it." Al Anderson always loved the idea of being able to get away in the water, floating quiet in his own little world. "From the time I was a kid, I can remember going out with my dad and one of his friends in a canoe and [loving] the whole concept of having this little personal watercraft and I hate to use that term because now it means jet skis, which is abhorrent to me,"he grimaces. He also deplores the idea of a two-seater kayak, known as a double he calls is a "divorce boat,"reasoning that it represents a galley-slave experience for the occupant in tandem. He opens the door to his shop, otherwise known as Betsie Bay Kayak world headquarters. It is a place he rarely lets people see he likes to keep his designs and techniques proprietary and it is neater than most workshops, filled with state-of-the-art equipment, all manner of woodworking tools and the jigs he uses to bend his kayaks into their needle-like shape. There's a kayak in progress in the finishing room next door, and evidence of scraps from paddle-making, which also keeps things afloat. Paddles range in price from $220 to $350 and are considered among the best in their category. Anderson often turns down other people's ideas for custom boats because he simply doesn't want to bother with something not of his design; that's the part he loves. The physics, the engineering, the artistry. "Often it's a feature that they've seen on someone else's kayak, such as a hatch or seat features that are trendy but not necessarily based in science, like cup-holders and other gadgetry,"Anderson says. "If someone wants a cell phone holder built into the deck, I'm certainly going to try to talk them out of it." He opposes any embellishments that distract from the experience. "It's all the years of martial arts. It teaches you to be in the present. Most of us live in the reflection of the past or fear of the future." But not Al Anderson. Especially when he's out on the water, sitting in the quiet of the moment, wrapped in an ancient design with a modern soul something any Eskimo would paddle with pride. There's a devoted following of hard-core paddlers who swear by the hand crafted Greenland style boats the Andersons produce. Grand Rapids attorney and Greenland kayaker Star Swift used a Betsie Bay Grafite paddle on her part-solo voyage across Lake Superior last summer and gave it her top rating; she also gave an A+ to her kayak, a 17 foot, 36-pound Betsie Bay Valkyrie. "I thought I was going over more than once this summer but never did. I pulled or paddled her over countless rocks, pebbled beaches, logs and sand, yet her hull still looks pretty good." So said Swift's review of her equipment when she posted it on the West Michigan Coastal Kayakers Association Web site (http://www.wmcka.org), which tracked her lake crossing last year. 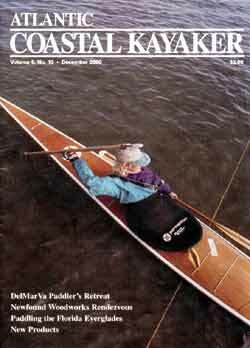 Veteran paddler Cindy Cole of Bethany Beach, Delaware owns several Betsie Bay kayaks and paddles. "The construction is very good and the boats overall are very strong. Aesthetically, I do not know of any boats that have the same beautiful lines that the Recluse and Valkyrie have," says Cole, who used her 19 foot, 37 pound Recluse in the Greenland National Competition last summer." The Greenlanders accepted it as Greenland style and were impressed with its speed–several Greenlanders asked me to leave it with them," she says. Cole won first place in short distance, second in long distance and first in rolling. Her husband, Charlie, another paddler who has attended kayak symposiums over many years, says "nothing out there competes with the Recluse in all areas." Cindy says the paddles are also the best:"[they're] all we have used in the past 10 years." Plenty, and it helps if it compliments your craft. "The Inuit stroke is much shorter and quicker," says the kayak and paddle crafter Al Anderson, "with the paddle held low–just enough to clear the deck of the Greenland kayak." He explains that since the stroke is shorter, less arm motion is required. Mostly torso rotation, the same as used when walking, propels the boat. "The motion can be performed without fatigue much more readily than the larger Euro-modern technique. Because the paddle is not moved as far, nor lifted nearly as high on each stroke, a tremendous amount of energy is saved over the tens of thousands of strokes applied on each trip." As with his kayaks, Anderson replicated the style of ancient Inuit designs that were used for long-distance paddling, using modern woods, epoxy, carbon fiber, fiberglass cloth and high-tech linear polyurethane finishing materials. As the first U.S. company to market the Greenland style paddle, Betsie Bay Kayaks has perfected five models, ranging in length from 72 to 96 inches and maximum 4-inch widths.